Yesterday in my WWDC wish list I included a request for pulling Apple’s podcast player out of iTunes and promoting it to a dedicated app on the Mac just like it is on iOS. iTunes in its current form can be a mess as a music player, but at least that tries to be its primary function; being a good podcast player is hardly the focus of iTunes. Aside from removing part of the bloat from iTunes, promoting podcast playback on the Mac to its own app would solve several existing problems. First, there are issues introduced with the recent iTunes 12.4 update. Apple re-introduced the sidebar navigation to iTunes with the goal of simplifying the experience and included an option to disable it, but turning it off doesn’t revert to tab bar navigation like it does in the Photos app. Turn off the sidebar in the Recently Added section of Music and now you can’t navigate to the Artists section in Music without turning it back on. No problem, just leave it on for Music. But go to the Podcasts section and notice the sidebar isn’t as necessary. I use Recent Updates and Podcasts but not Stations (which can be removed) but a whole column for two or three options is overkill. But turn it off for Podcasts and it turns off for Music which traps you. For me, the solution is to mostly live in the Unplayed section which is a separate tab bar option and doesn’t show the sidebar. Another oddity created by iTunes the music player is that smart playlists like 90’s Music appear in the Podcasts section as podcast playlists but show music. A separate Podcasts app wouldn’t have this awkward and nonsensical behavior. Another problem with having podcast playback happen in a music player is sharing the same playback settings. 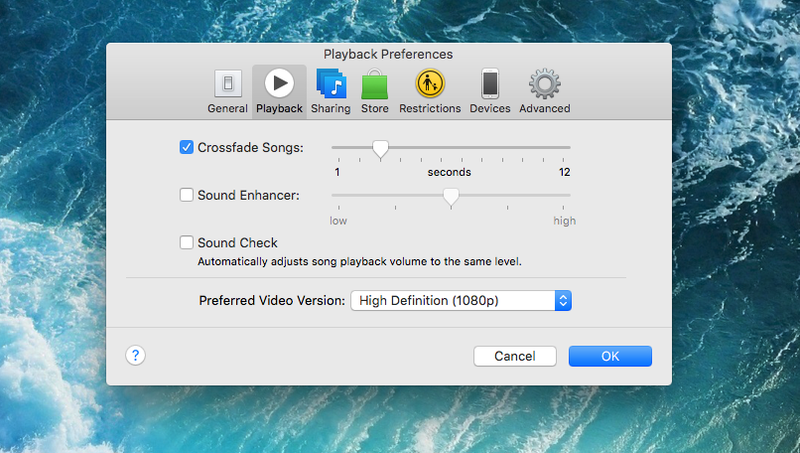 I really like the Crossfade Songs option on iTunes for continuous Apple Music playback. Spotify does this on iOS and it’s something Apple Music should add there too. But it’s super jarring when the end of one podcast crosses into another podcast. Stacked spoken word just doesn’t have the same effect. Obviously the Crossfade Songs option should only apply to songs and it doesn’t, but iTunes is full of these examples. iTunes is also just not as good at podcast playback as iOS. Apple’s Podcasts app on iOS includes an Up Next feature for managing a temporary episode queue without making a dedicated playlist. Up Next for Podcasts works just like the Music app on iOS but separately. iTunes on the Mac shows the Up Next option when playing podcasts, but it only works for music. The Up Next section on the iOS Podcasts app is also where you’ll find chapters on supported shows like 9to5Mac’s Happy Hour podcast. Up Next is music-only on iTunes, and chapters just aren’t supported. Podcasts for iOS also includes a timer for stopping playback, speed controls, and back and forward skip buttons that jump 15 seconds. iTunes lacks these podcast features and using back and forward skip buttons can easily lose your place in an episode. Apple has a Podcasts app for iPhone, iPad, both Apple TVs, and CarPlay, but the experience is subpar on the Mac as it’s buried inside iTunes. One last example: love. iTunes lets you ‘love’ what you’re playing with a heart icon so Apple Music can better learn your music tastes and bookmark tracks as favorites. This works the same way on iOS. iTunes also lets you ‘love’ podcast episodes because it’s in the same app, but it’s really only used when creating a smart playlist. There’s no love option on iOS and I’m guessing a dedicated Podcasts app on the Mac wouldn’t include the option either. The same is true for star ratings. 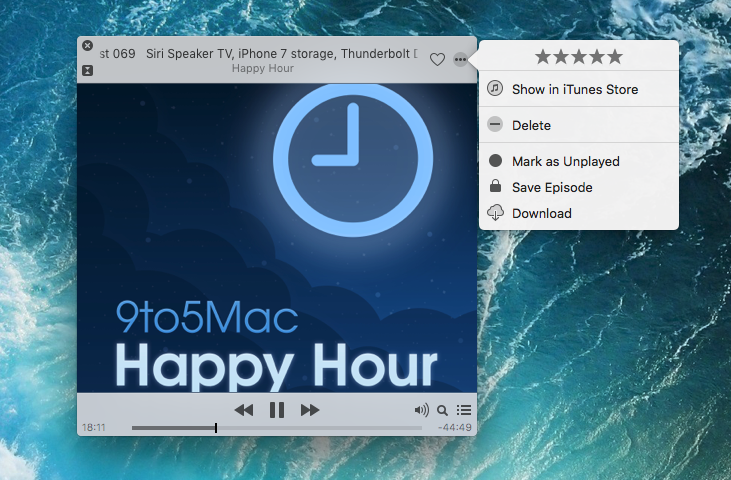 Complaints aside, iTunes is still a half-decent podcast player on the Mac. I use it almost daily. One benefit of being tied into iTunes is you can download iTunes on a Windows PC, sign in with your Apple ID, and your podcasts are all right there and sync like on a Mac. But the podcast experience on a Mac shouldn’t be limited for that reason alone. And there aren’t many options for podcast playback on the Mac. Before iTunes, I used Instacast which offered a great experience but ran out of money for development. I also like Apple’s apps because they’re on iPhone, iPad, the Mac, CarPlay, and both Apple TVs (just not Apple Watch). Downcast is another podcast player that’s also on most of Apple’s platforms including CarPlay and even Apple Watch but not Apple TV yet. Promote podcast playback on the Mac to a dedicated Podcasts app outside of iTunes (and someday throw in an Apple Watch app?) and I’d be totally happy.